Welcome to Day 12 of Trainwreck’d Society’s Month of Horror Showcase. Every day during the month of October, we will have a horror related interview and/or film review for your fright-filled reading pleasure! The set up will be the same as usual, but the topics will be far more terrifying. Enjoy! We have a brilliant addition to our Month of Horror showcase today folks! Today we have some lovely answers from the even more lovely actress Tracey Birdsall. Tracey recently appeared on the sci-fi thriller Rogue Warrior: Robot Fighter. And while the film may not be strictly identified as a “horror” film, it is a truly frightening depiction of what may happen when we let technology go too damn far. And honestly, that is about as scary is it gets for me! Tracey is amazing is this film, which also features our dear friend Marilyn Ghigliotti in a prominent role. I went into viewing this film for Marilyn, and came out a huge Tracey fan as well. So let’s just dive it her answers, shall we? Please enjoy some amazing words from the brilliant Tracey Birdsall! Tell us about your latest film, Rogue Warrior: Robot Fighter? Rogue Warrior: Robot Fighter, is a sci-fi/drama/character-driven action film that came out in June of this year. And on the VOD channels, what category would you suggest it be placed under? Though I assume everyone was a pleasure, is there anyone on the cast and crew you particularly enjoyed working with? William Kircher, Daz Crawford, Stephen Manley – they were all such a pleasure to work with. Marilyn Ghiglioti was charming too. What are you most proud of about the movie? It’s a labor of love, you know?! You put your all into something for a couple of years, and then people enjoy it – it’s memorializing. I’m proud of the hard work and the long hours – the bruises and scars, but it’s the final product that makes me most proud. Was there ever a moment on the film when it became ‘work’ to you – or is it always fun? Maybe a bit of both? Don’t get me wrong… it’s always work, but I love what I do… Sometimes it’s frustrating, sometimes it’s brutal, sometimes (oftentimes) it’s really hard, but it’s rewarding to say the least. We’re about to enter the ‘scariest’ month of the year – are you into spooky movies? Who might your favorite horror monster icon be? Did you ever participate in dress-ups? Remember who you dressed as? Have you a go-to movie around Halloween? Not really, I like a good scare, but sometimes it’s the classic Halloween movies that make a comeback every year. Life is scary enough… I just roll with what everyone else wants to do/watch! Do you think your movie works for Halloween, too? 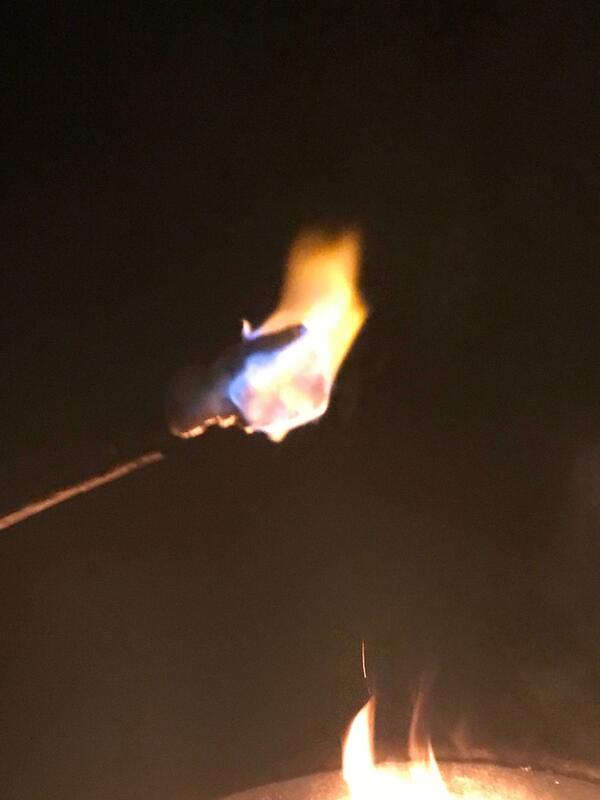 The marshmallow I just roasted over an open fire! (After filming a scene for The Time War)!! !